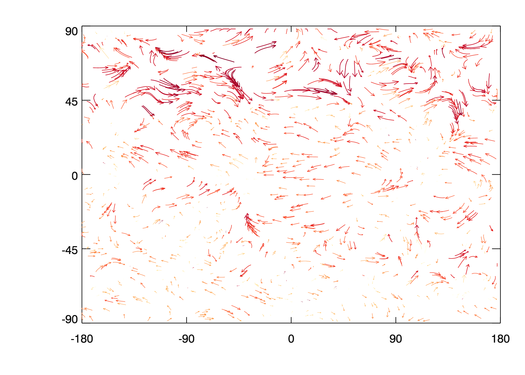 Make streamline plots of 2D vector fields. Add the heads to the arrows. Compute the streamlines from each starting point. 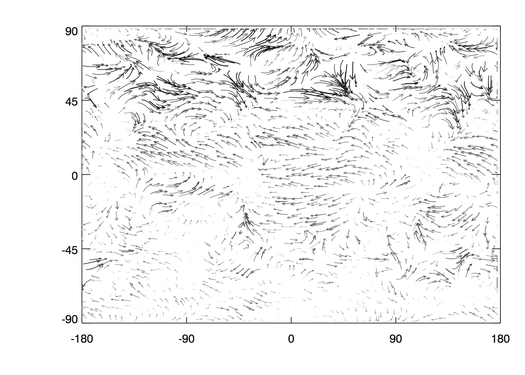 Draw a velocity (flow) field with streamlines following the field proportional in length to the vector field magnitude. A random number of starting points can be picked (with NVECS=n) or a grid of starting points jittered slightly to eliminate linear patterns (with /GRID, STRIDE=3, and JITTER=jit). NVECS random points within the (u,v) arrays are selected. For each "shot" the field (as bilinearly interpolated) at each point is followed using a vector of LENGTH length, tracing a line with NSTEPS segments. An arrow head is drawn at the end.